If you’ve done any research on the Virgin Islands at all, no doubt you’ve come across articles and stories about Foxy’s Bar on Great Harbour in Jost Van Dyke, BVI. It’s one of the most famous bars in the world–not just because of its amazing location, fantastic menu, legendary events, handmade beer or signature rums–it’s because of it’s founder, Foxy Callwood. Foxy’s Bar is undoubtably one of the most special places in the world, due in large part to its funny history and in bigger part to its namesake—Foxy Callwood. The story goes that in the late 1960’s, Foxy Callwood identified the need for a bar on Great Harbour. The reason? The nearby churchgoers giving thanks for another successful sugarcane harvest needed a place to celebrate with a libation or two. So, being an exceptionally smart entrepreneur, Foxy’s was born. Foxy quickly poured a cement slab and erected a “temporary” bar where he began making friends and building his reputation as the island’s “ambassador of fun.” In 1968, he moved the bar just down the beach to where it stands today. It’s charm is unmistakable. The drinks, unparalleled. The location, stunning. But the one thing that Foxy’s Bar has that no other does is Foxy Callwood himself. Phillicanno “Foxy” Callwood is a 7th generation Jost Van Dyker who started out as a fisherman with an eye for the ladies. Legend has it that the charter captain he worked for grew so tired of Foxy chasing all the lady cooks on board his fishing vessel that he took Foxy on a near “round the world” cruise in search of a wife. The trip was a success when Foxy met his lovely wife Tessa, who returned with him to Jost Van Dyke to live. Today, Foxy and Tessa Callwood run the most famous beach bar in the world. Time Magazine listed Foxy’s as one of the three best places to spend New Years Eve (Times Square and Piccadilly Circus were the other two)–and it’s no wonder, because the Callwoods estimate their guests number in the tens of thousands on that night. What makes it such an incredible party? Foxy, of course! He’s a singer–you can download his songs from iTunes. He’s a storyteller like no other. He’s a jokester, a prankster, a comedian. He’s funny, incredibly intelligent, and highly entertaining. On any given day, you’ll find him strumming the guitar and telling jokes to the crowd gathered at the bar—most of which you could never repeat in mixed company. He even had an “Epoxy Foxy” made–a statute of himself–so guests wouldn’t feel slighted if they came to the bar and he wasn’t there. Most importantly, Foxy is a humanitarian who dedicated his life to improving the quality of life for the people of the British Virgin Islands. One example is the sloop that Foxy is funding and helping the native children build on the land behind his bar. He started this project for the kids so they would learn and preserve the skills of their ancestors while learning the importance of commitment, time management and teamwork. 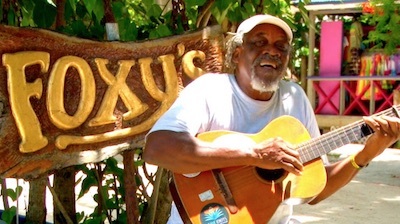 In 2009, Foxy was knighted by Her Majesty’s Government for his numerous contributions to improving the quality of life for the people of the BVI’s. You can call him Sir Foxy, or Lord Callwood, but no matter what you call him, Foxy Callwood is a one of a kind. Foxy’s Bar is known for it’s events—they can make any holiday, not matter how trivial—last for a week. If you can visit Foxy’s during one of the their scheduled events—do it. You won’t believe how fun they are. Some of our favorites include the Halloween Catfight, which happens sometime in the week before Halloween (which is crazy fun as well). The catfight is actually a boat race for Catamarans (any boat, really), with the race ending at Foxy’s. The party is ON when all the boats are finally in the harbour. Another favorite, and a bit of a departure from the typical debauchery, is the Thanksgiving Celebration. Everyone sits down together at 6:30pm sharp for a Caribbean style traditional Thanksgiving feast and the love and fun flows. Finally, we’d remiss to leave out Foxy’s Old Year’s Night party, which attracts between 10,000-30,000 people (depending who you ask) and goes for about 3 days. The harbour is full of boats, the live music from great bands goes all night long, and the drinks never stop flowing. Pace yourself! A stop at Foxy’s Bar is a Virgin Islands tradition, so if you get the chance, spend an hour, a day or a weekend at Foxy’s.